It was on June 11, 2017, when the Warriors of Zimbabwe began their 2019 Africa Cup of Nations (Afcon) journey with a 3-0 spanking of the Lone Star of Liberia. Today, close to two years later, at the National Sports Stadium, the Warriors hope to complete that journey, in the same flourishing manner they began it, with a glut of goals against Congo Brazzaville and secure a place at the 2019 Afcon finals in Egypt in June. Forget about the National Sports Stadium incident in which the Warriors were denied entry or the new Umbro-kit debacle, because the focus should be on the accomplishment of a mission whose journey started off so brightly before a capacity crowd on that June 11 afternoon, and for that matter, with Norman Mapeza at the helm. The driver has since then changed to Sunday Chidzambga in what has been a topsy-turvy journey whose fruits could have been reaped as early as October 16, 2018, with a win over the Democratic Republic of Congo (DRC) at the National Sports Stadium, but the Zimbabwean Warriors could only stutter to a one-all draw to leave the game on. Worse still, Chidzambga's class made their own trip even harder on November 17, 2018, when they lost 1-0 to Liberia to leave themselves with the heavy burden of fighting for their place at the finals on the last day of play -- which is today, but better still at home, at the National Sports Stadium. However, listening to Zimbabwe football followers discussing today's game, they are unanimous in their agreement that their team will win -- convincingly -- and qualify for the expanded Afcon finals, which for the first time will feature 24 teams. 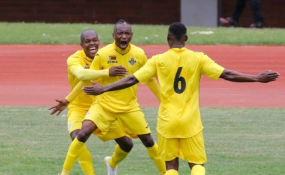 There is justification in the football lovers' optimism because there is every reason to have belief in a team that has so much class and experience in the form of Knowledge Musona, Khama Billiat, George Chigova, Talent Chawapihwa, Admiral Muskwe, and Tendayi Darikwa, and could have had more to that array of talent had Marvelous Nakamba not been injured and Macauley Bonne sorted out his Zimbabwean passport in time. What is also giving Zimbabweans hope is the fact that the Warriors are made up largely of players who know each other's play better as they have been together for some time, and most of whom helped the Warriors qualify for the 2017 Afcon finals in Gabon under the coaching guidance of Kalisto Pasuwa. The millions of Zimbabweans out there believe that the Warriors will regain that spirit of togetherness that saw them secure qualification for the 2017 finals with two games in hand. Even those who were not part of the class of 2017, Tendai Darikwa of Nottingham Forest in England, Aleck Mudimu of CEFN Druids n Wales, Kelvin Lunga of SV Rödinghausen in Germany, and Admiral Muskwe of Leicester in England, have been ready to sacrifice everything -- including their first team places at their clubs -- just to see to it that the Warriors qualify for Afcon 2019. It would be cruel should the Warriors fail to qualify since they have been the most consistent team in the group and are still at the summit of Group B with eight points, two above the DRC and three ahead of both Liberia and Congo Brazzaville, and for that matter, having won in the intimidating jungle of the DRC. However, today marks the day in which Chidzambga's collection should prove that they are really among the best African football has to offer at the moment. In a tournament where almost half of the continent's 52 countries qualify for the finals, failure to make the continental rendezvous would constitute a national embarrassment. From the outset, the Warriors need only a draw to qualify for the finals, but the truth is that the Zimbabweans need an outright win to guarantee themselves qualification as focusing on a draw could lead to disaster should the Red Devils score first. Success for the Warriors against the Red Devils and qualification for Afcon 2019 will lay down a marker for Zimbabwean football for years to come and will also bring confidence and self-belief ahead of the 2022 World Cup, whose qualifying rounds are just around the corner. The fact remains that all pointers lead to the Warriors qualifying for Egypt, 2019, but they cannot do it alone and need the support of everyone to ensure that they join the best football teams on the continent. With a familiar home turf -- an expected huge home crowd -- and a coach whose CV chronicles too many fine achievements, there is every reason to believe that at around 16.45 hrs or somewhere around there, the Warriors would be celebrating Afcon number 4. So let us all go and rally behind the Warriors. Go Warriors Go.